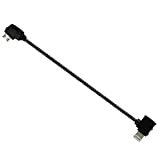 · [Lightning to Micro-USB] plug for Apple products. Length 9.3 cm/3.66 inch for iPhone, 20.7 cm/ 8.14 inch for iPad. · [Micro-USB to Micro-USB] plug and [Reverse Micro-USB to Micro-USB] plug for Android system products. Length 9.3 cm/3.66 inch for cellphone, 20.7 cm/ 8.14 inch for tables. · 6-month warranty, FREE NEW CABLE if product not working or damaged during warranty period.